Welcome to Smart Factory! Your machine can get Variety of Expression & Intuitive Operation. Pro-face, an HMI specialist, is going to release a new screen creation software. 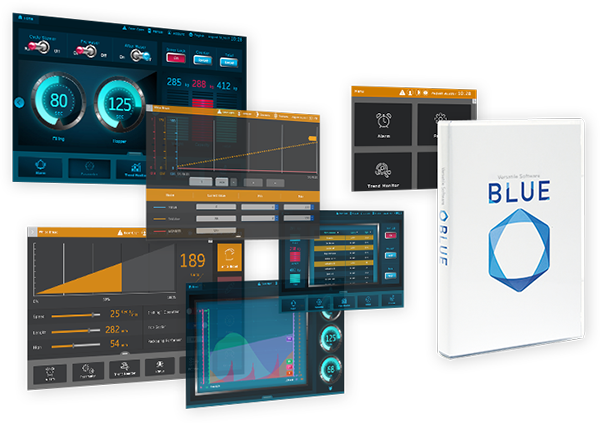 BLUE, a ground-breaking new screen creation software, with its rich expressive interfaces, allows anyone to design intuitive operating interfaces to their equipment. In an environment surrounding recent manufacturing floors, manufacturers should deal with diversifying needs of customers and globalization. Equipment has been highly sophisticated and a huge amount of device data (big data) has been obtained. The needs of easy-to-understand equipment with high visibility have increased accordingly. “BLUE” can satisfy those needs. That improves operability of equipment and makes accurate operation possible even at a scene that requires speedy response. Display with high visibility and operability contributes to reducing the time taken for recovery and changeover. That leads to increase in productivity on a manufacturing floor. Furthermore, high-quality graphics and fonts make equipment look classy, not to mention the fact that visibility is improved. The product is also suitable for equipment with high usage frequency, such as food processors and wrapping machines. Anyone can instantly reach easily understandable information. Responsive design shows easy-to-see and desired information. Familiar smartphone like gestures for navigation and operation. Just one step to show detailed information with the Zoom function. Clearer fonts and parts make an obvious difference. View all needed information at once. BLUE provides means to combine multiple screens to one. With OPC-UA Server supported, you can transfer equipment information smoothly to a host database. Numerous control devices around the world can be connected. Users can select a driver that meets their needs. The efficiency of the existing screen creation is improved. Diverting and customizing screens is easy. Gesture screens can be easily created with Drag & Drop. Using grid cell editing you can automatically adjust the object's size and location. Adjustment work of layout change is reduced. Left Navigation is automatically generated. No need to place switches for screen change.